Is Cancer Curable If Detected Early ...? Recent scientific research shows greater than 90% survival rates, when cancer is detected before it spreads to other organs. Later detection reduces those survival rates to less than 10%. Cancers are diagnosed in four stages, and the first three stages are subdivided into three levels. At stage I, the disease is found in only one organ. By stage II, the cancerous tumor has grown significantly, but it is still entirely contained within the originating organ. In stage III, the cancer spreads to the lymph nodes. From there, it spreads to other major organs or throughout the body in stage IV. Medical science offers no effective treatment in this final stage. When colon tumors are discovered in stage I or II, medical treatment is 93% likely to extend patients� lives by at least another 10 years. A straightforward surgery generally is followed by low doses of radiation therapy. When cancer is well established and spreading (stages III and IV), these measures are unlikely to be effective, and survival rates drop precipitously to less than 10%. Unfortunately, colon cancer produces very few and usually unnoticeable symptoms in its early stages. Only one-third of its cases are diagnosed in stages I and II. 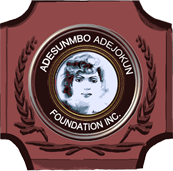 That was true in the case of Adesunmbo Adejokun (ah-duh-SUM-bow ah-duh-JOE-kun ). There were no warning symptoms, when a small polyp developed inside her colon. When this polyp changed into a cancerous tumor, symptoms that could have alerted her were still months (perhaps years) away. When she first noticed abdominal pain and later bloody stools in 2005, the cancer already had progressed into stage III. Adesunmbo lamented, "How could I have colon cancer? I am less than 50 years old. How I wish I had found this problem earlier! I do not want anyone else to be in my position." However, the truth is that the exact causes of colon cancer are unknown, and it may cause no noticeable symptoms, until it is too late. When doctors finally diagnosed her cancer, they gave Adesunmbo only 6 months to live. Fighting an uphill battle, and determined to cleanse herself of this merciless disease, she fought for her life medically and spiritually for the next three years. After several rounds of chemotherapy, the cancer that had spread to her lungs began to shrink. Momentarily it appeared that she would defeat her cancer. However, chemotherapy later became ineffective, when her stage IV cancer suddenly turned aggressive and spread throughout her body. In April of 2008, she heroically volunteered as a subject in the clinical trials of new therapies. Very weak, with the cancer spreading uncontrollably, she took strong doses of palliative radiation therapy until her death in January of 2009. Colorectal cancer is like many other cancers in its survival rate. When diagnosed early, more than 90% of patients live more than 10 years, after low-risk surgeries. But late diagnosis, after tumors metastasize, is followed by infusions of fearfully toxic chemicals and brutal blasts of radiation. And the prognosis is as miserable as the experience. We all must practice specific cancer prevention and overall wellness to beat this dreadful disease. We must ensure early diagnosis with annual medical examinations and regular disease screenings at public wellness fairs. We must consult with medical professionals at first signs of cancer, and then follow their advice to the letter. More effective cancer screening techniques are becoming available. Researchers are refining sophisticated protein tests that pick up molecular whispers in the bloodstream. They are testing next-generation imaging and nano-particle techniques that identify and isolate tumors. Some routine screening methods already are very effective in diagnosing various cancers. The pap smear detects cervical cancer; the prostate specific antigen (PSA) blood test finds prostate cancer; mammograms locate small breast cancers; and colonoscopy finds colon polyps even before they become cancerous.